Our BHS team hopes to celebrate at TD BankNorth Garden tonight! The Burlington High School Boys Hockey team(17-1-6) will take on Milton High School (19-3-2) at 8:15 tonight at the TD BankNorthGarden. Below are the latest stories on the two teams, including a few that will help you learn about some of the key players from our opponents, the Milton Wildcats. Burlington (17-2-6) became the first team to drop a Super Eight play-in game and reach the Div. 1 state final since 2009 after ousting defending champion Wakefield in Monday’s North final, while Milton (19-3-3) is making its first state final appearance. The Red Devils hope their depth will be enough to solve Wildcats goalie Jay Hankard, who has yet to allow more than one goal in any postseason game. At the other end, Milton’s high scoring trio of Paul Curran, Brian Higgins and Terrance Walsh must break through Burlington netminder Derek DeCastro and a defense that has given up an average of two goals per game. 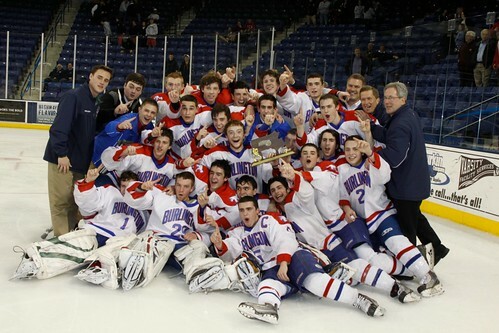 Milton High Boys Hockey Team Prepares For State Title Game - from the Milton Patch. What time does the fan bus leave BHS? Thanks.